UnionBank recently launched a promo called Every1’s A Winner, where for 11 weeks starting 11-11-11, every customer who gets approved for a car/home loan will be rewarded with a GC (ranging from 1100-11000). 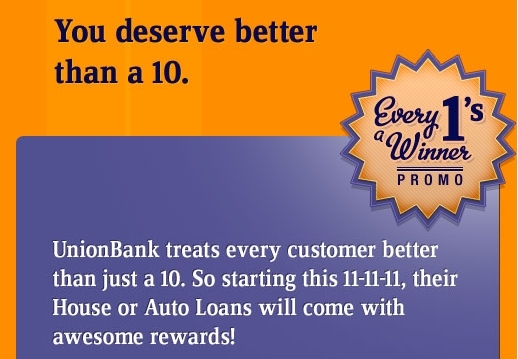 The campaign harps on the idea that the consumers are more than a 10 to UnionBank — in fact, they’re an 11. In line with this campaign, UnionBank sponsored a blog contest on TechnoBaboy where the winner gets P5,000 cash. Read on for the qualifications and mechanics of the blog contest. Open to Filipinos residing in the Philippines for at least a year, at least 18 years of age at the time of joining, must have a Twitter account with at least 15 Twitter followers. “Why are you more than 10 as a techie? 5. Each Twitter account can submit as many answers. However, each account can only win once. I’ll pick the top 3 entries and UnionBank will choose the winner from the top 3 entries I selected. Credit here refers to your standing on Twitter and simply means that the entry is genuine and not considered as spam. The winner will be announced in UnionBank’s Twitter account (twitter.com/myeasyloans) and in this post or on my Twitter account within 5 days from December 11, 2011. THE PRIZE: P5,000 cash to be awarded in February 2012. You are encouraged to read the full mechanics and guidelines which you can find here. ibigay mo sa akin ang 5k. hehe.